WineScribble travels to Ktima Gerolemo Winery in Omodos Village in Cyprus to find out more about Morokanella wine. 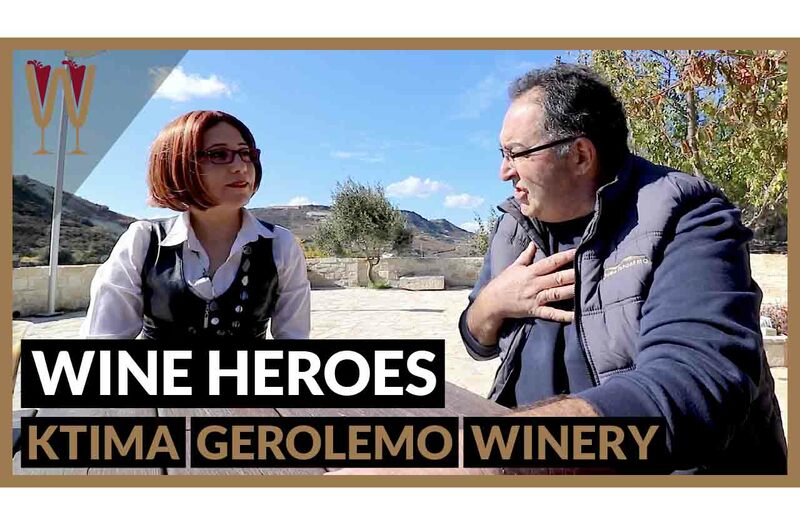 The Ktima Gerolemo (Κτιμα Γερολεμο) Winery has a rich history, and the director of this Cyprus Winery was happy to share some stories of his memories of making wine in Cyprus. WineScribble is also treated to a tasting of the award winning Xynisteri and Morokanella wines, a special Yiannoudi (Giannoudi) wine that is only available at the winery, and also the award winning Ktima Gerolemo Commandaria and Zivania wines. This is Morokanella, a Cypriot aromatic white wine. It’s been around for hundreds of years but we’ve only recently rediscovered it. In fact, it nearly went extinct. Only a couple of producers are currently making Morokanella wine using these grapes. Ktima Gerolemo is one of these pioneers. I want to know more about Morokanella grapes and I want to know more about Ktima Gerolemo, so let’s go talk to them. So, I remember my grandfather waiting in the middle of the square to help us crush with a manual machine. I will show you inside one of those we have, and these pots which we have now here like decoration were situated in every house, not in only our family’s houses. Our house was one, two, three, four… four rooms and the bedrooms were on the second floor. And the three of the four rooms were full of pithari. Ok, and everything was together. Were you always involved in the Wine Making? After, when we become adults, we start loving discos, going cafe, and other the other things. We choose to study but not nothing common with with wine or cultivation of vineyards. We left it to our parents just to produce wine and grape and sell it further. And I am a computer engineer, my brother is a pharmacist. When my father retired, when he was 60 years old he said “let’s try to produce wine which we will bottle, and we will sell to tourists coming and visiting the village”. It was the beginning of agrotourism for Omodos then, the 1980s. The first coaches and the first groups started coming and visiting Omodos not because only of the Church of Holy Cross, but because it is, it was, a nice wine village and this is how we started. Where did you get the name Ktima Gerolemo? My father was the owner of a coffee shop in the middle of the square of Omodos which, to which, he gave the name Gerolemo Vini Bar. Nothing to do with bar it was a place where he was selling coffee and his wines. And we have this until now. I think it is your tasting room now? Then we said, what to do with this place, what we do with the other medieval museum, what to do with the vineyards? We have decided to carry on but in a more professional way. We bought our first equipment, one stainless steel tank, a manual filter, a manual bottling machine, no chiller then. What we produce around 3,000 bottles to people visiting the Omodos for wine trips. Second year what money we earn, we invest and we bought more equipment, all the time, and we came in a point where we thought to go officially and in a full professional way, we have to build a winery. We keep the name of my father, taken from the name he gave to the coffee shop Gerolemo, and we add in front Ktima, which means Estate Gerolemo, and we keep the same name. What is the main focus of Ktima Gerolemo? Where we focus to, was the quality and not the quantity. We charged some advisors, technicians, our enologist advising us. We couldn’t have full-time, engage this staff, so we were buying services. And this is what we do up to date. Our first recognitions came in 2013 awards from Decanter competition from Vienna AWC competition and, after this, it was like a boosting for us. Also, we start producing and doing wider range of wine types. We start looking in a better way to our vineyards and making them more functionable. Not more, giving more grapes because this is not that good. Mostly endemic, indigenous varieties. We follow the wave of improving and projecting the local grapes, and the local wines. Ofthalmo, Maratheftiko, we put Morokanella very very… 12 years ago. Yiannudi successful also 12 years ago. Success we had only two years ago. Last year, we produce our first Yiannoudi. Anyway, I am mentioning that we focus to quality and to indigenous variety. This is shortly what we did. We are going to have a short tasting of our wines. We will start first with a Xynisteri Drios, oak means Drios. It is aged in oak barrels for a short period of a couple of months. The colour, an ideal one for a white wine. I can smell the oak. A Xynisteri aged in barrels having the full body. Sommelier are suggesting to people even with souvlaki or a local meze, you can combine this Xynisteri, OK. Yes because this is much fuller body, very rich white. It’s very… it coats the tongue and it’s very velvety. Now, I want you to taste a second white Morokanella grape variety, which has the same name Morokanella. At the ages of our parents it was spread within the traditional plantations of Xynisteri and Mavro. From this grape variety can be produced an excellent, of an excellent quality, white wine with a very light taste. It is a typical Cyprus taste. By the way I forgot to tell you about the recognition gained for our… for these two wines. An international competition in Vienna where we gained silver metal for both. This looks lighter this white wine. Yes and tastes lighter. Flowers. Lots of flowers. It’s citrus and tropical fruit together. Well you can enjoy a glass of this wine just like that well chilled. Of course, always you have to think about serving under the right temperature, and to choose also the right company to have it with. Of course, of course, I love this pairing of Morokanella, great company and Halloumi. This is the Giannoudi, Gerolemo Yiannoudi. A variety which is very rare. We try to make the whole process of fermentation in an oak tank. A tank made wooden tank. We believe that the taste will improve after a couple of years but now let’s have a taste. Absolutely. An initial taste. So this is not available in the shops? Yes, not yet. It is still being bottle aged. Oh the colour is amazing. That’s actually, it’s magenta, that’s beautiful. Amazing as you said smell. And, so rich, this is beautiful. Mirabelles, plums. Plums, mirabelles. The purple red cherries that you get on Troodos. Yes, yes, yes. Imagine that it is only one year old red wine. It’s very, it’s already very very smooth. Very sophisticated cats here at Ktima Gerolemo. Oh hello! Okay you cannot have my Giannoudi. We are having our tasting in our cellar where we age our Commandaria. Let me introduce to you Vassilis which is my son-in-law, and he is also going to join us in a demonstration of our Commandaria. So I am offering this to you first. And Vassilis will explain what is the characteristics of this wine. Now we will try one Commandaria 2013. Okay. It was five years in those barrels. You smell the aroma like vanilla. Yes vanilla. Yes, and caramel. Lots of caramel, sweet spices, a little bit of nutmeg, and cloves, cloves. The alcohol by volume is 11.5% they are usually much higher. From the natural way of production of Commandaria, this makes our Commandaria accessible to a wide spectrum of Commandaria lovers. There are these people who doesn’t like strong tasting Commandaria. This is very smooth. Very velvety. It’s beautiful. So, how long was this in oak? Almost five years, almost five years, yes. I am going to introduce to you, and give you to taste, our Zivania. Our Zivania is yellow because is we keep the Zivania in barrels, and is getting a different colour and a milder taste. And, we are always serving it chilled from the freezer. So please have one of these glasses. So this never freezes solid because it’s so high in alcohol. Wonderful! Yes. You know we drink this in shots. Just one shot. If it is one shot, it can can be covered with the Halloumi cheese or one olive. Perfect, so cheers! Guys thank you very much for all the hospitality. My grandmother was using this like a general purpose medicine. Oh yes. Making massage. You know all our grandmother’s or old people were using Zivania as a medicine. We don’t. I can see how it could fix many problems. Yes. Cheers! That was such an exciting experience. I find it fascinating how the story of the Morokanella grape, and the story of the Gerolemo winery run parallel. The family behind the Ktima Gerolemo Winery have been making wine for generations, for hundreds of years. Like Morokanella they took some time out of traditional small-scale winemaking, but now they have returned with some of the most highly polished, elegant wines in the Cypriot market. And I couldn’t resist leaving with a great selection for me to taste and taste. Cheers everyone! Tasters, I have some more information about Ktima Gerolemo, and I’ve left it all in the description below. If you have enjoyed this video, hit the thumbs up button, share it with a friend, subscribe, and don’t forget to leave a comment below. I love talking about wine. I’ll see you on the next video.